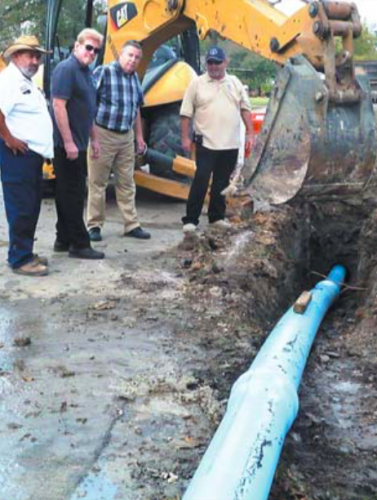 Jacinto City, TX — The current Jacinto City Water Line & Fire Protection rehabilitation project is the latest in a multi-year effort to rebuild the oldest portion of Jacinto City’s aging water distribution system. The current project’s base cost is $ 973,446 with the Harris County Community Development Block Grant (CDBG) funding for communities providing 80% of the cost. When completed it’ll provide 62 blocks of new water main lines at a fraction of the cost to the city. The first phase replaced the largest main supply trunk lines down Mercury Drive and Holland Avenue. The second phase is installing new lines to the oldest homes in the Industrial Addition from the 10100 blocks through the 10700 blocks south of Market Street Road. Atascocita #2 QB Daveon Boyd eludes the grasp of a Mustang defender and scores the winning TD in overtime. 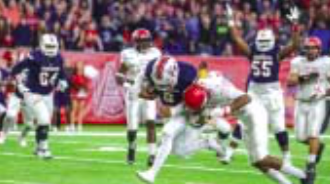 HOUSTON – NRG stadium was the scene last Friday night, as North Shore and Atascocita battled in an epic struggle for victory in the Class 6A Division I and III regional championship. There were plenty of thrills for the fans in the NRG stands. In the 3rd quarter Eagles QB passed to Lujuan Winningham, who ran 60-yards for a 2120 lead. Then in the 4th quarter, the Mustangs scored with a 17-yard TD pass, with only 1:31 on the clock. The Eagles answered with a 36 yard field goal, to tie the game at 27-27 as time expired. In overtime, North Shore fumbled on their first possession, and the Eagles took over. Next, their QB Daveon Boyd charged into the end zone with a 6-yard winning score, ending the game at 27-33. The game was punctuated by thrilling plays on both sides. North Shore scored first, on an interception and then a 72-yard, seven-play drive back to the end zone, to take a 7-0 lead in the first quarter.